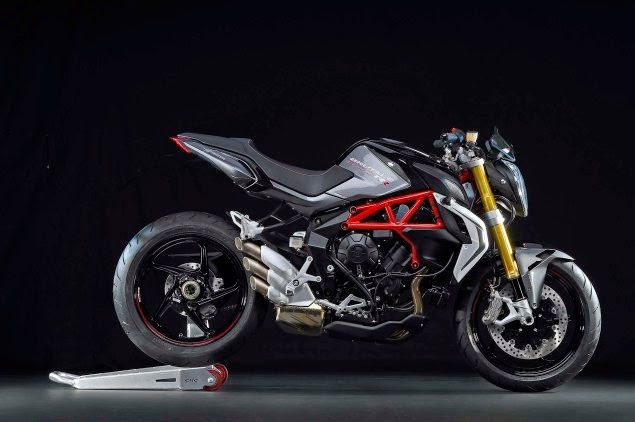 MV Agusta no longer cover their flagship products that will appear at the EICMA 2014, Milan, which will begin on November 4, 2014. 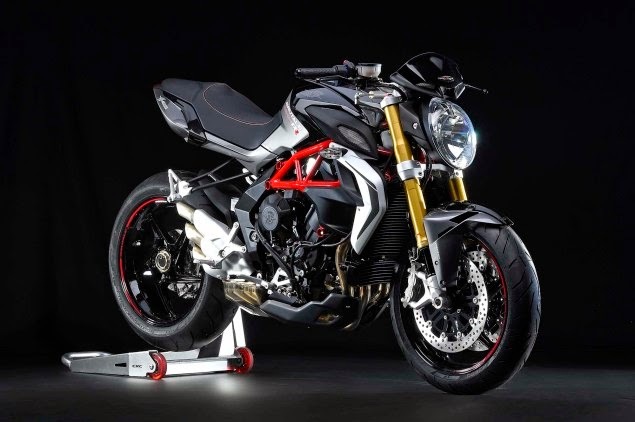 The days of the teaser is over, now the Italian exclusive motorcycle manufacturer led to the complete specifications and photos of the Brutale 800 RR which will accompany the birth of Dragster RR. Most noticeable is increasing of the engine's power performance. A three-cylinder engine with a capacity of 798 cc that claimed capable of spraying up to 138 hp @ 13,100 rpm of power and peak torque reaches 85.9 Nm @ 10,100 rpm. Power is obtained from a redesigned airbox and the presence of a second injector for each cylinder. The form in the tank is also redesigned, leaving an identical shape with grooves on the outside. There are additional the hydrolic chain tensioner to reduce noise and performance. The cranckshaft system and shape and also 6-speed transmission is still the same. Of course, electronic devices will accompany the rider to optimize on while driving. 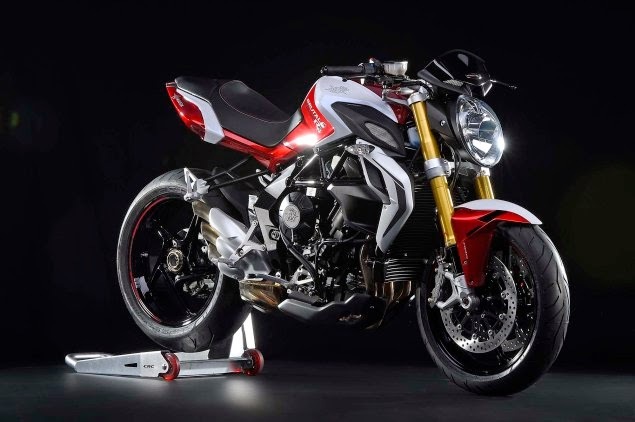 Such as MV Agusta ride-by-wire control with three driving modes as needed. There is 4th additional mode which makes the rider free to set the engine, rpm limiter, torque, throttle up sensitivity and braking. The transmission system with electronically-assisted quickshifter tech which makes the motorcycle light, smooth, and responsive while shifting gears. Slipper clutch makes the Brutale 800RR gearshift will adjust to the engine rotation to maintain security. Eight traction control settings ready to pamper the rider. By using the same frame with the regular Brutale 800, as well as the adjustable upside down front suspension of the Marzocchi. The rear suspension is supplied by Sachs. 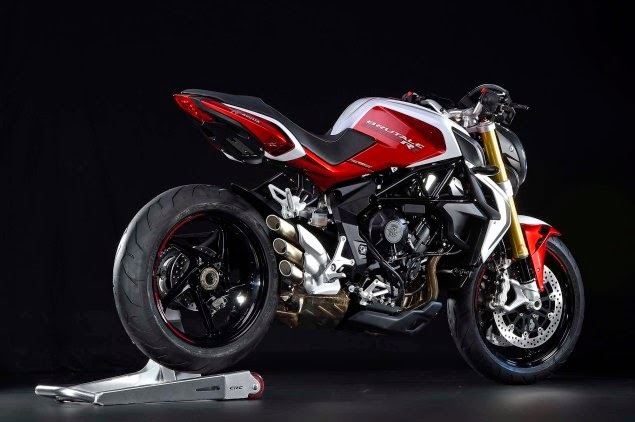 And Brutale 800 RR wear the Brembo's double disc in front with four-piston calipers.